Cacoon is a hanging tent concept that's quirky and cute, as well as safe and strong for adults and kids. It's small and compact so it can easily travel with your family anywhere, but once it's set up, Cacoon is big enough to share. 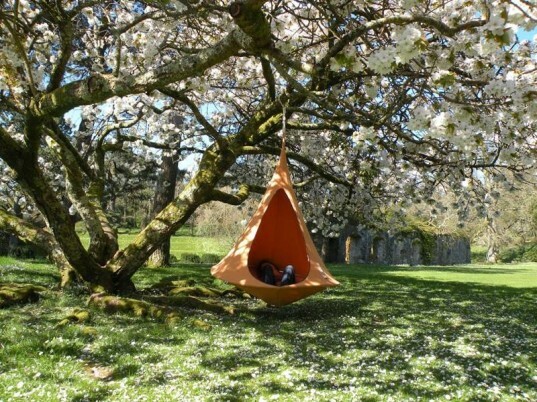 Take this sweet hanging tent with you to the woods, beach or on any family vacation, or even use it right at home to relax indoors with a good book. Keep reading to learn more about this affordable go-anywhere tent experience. Cacoon is a hanging tent that’s weather tested to withstand wind, rain, sunshine and sea, but it hangs equally nicely indoors as well. 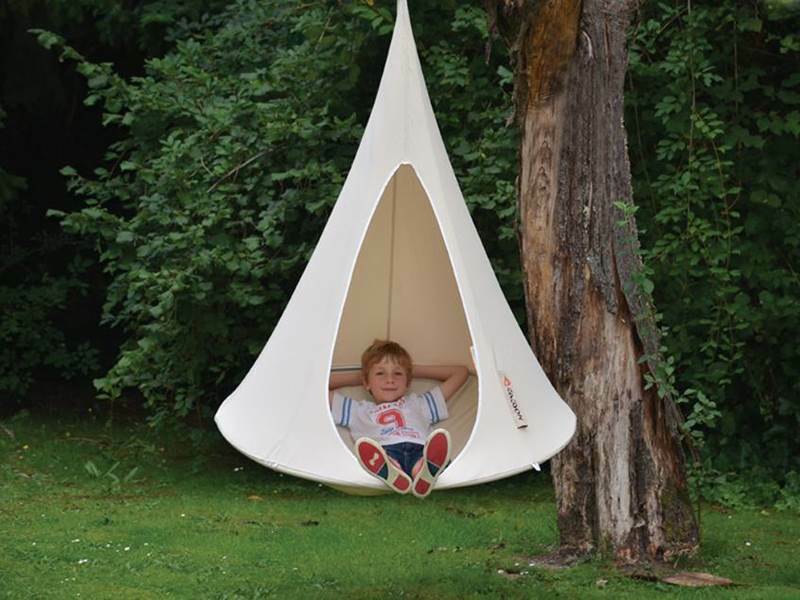 Made with both adults and children in mind, this tiny hanging nest-like tent is a must for private relaxation and fun, created by a team of folks well-versed in safe, architectural fabric and textile technology for onshore structures. Due to Cacoon’s lightweight, non-rusting aluminium ring you can easily pack and carry Cacoon with you on vacation or move Cacoon to a new spot in the garden with ease. Every hanging Cacoon is made with fabric developed for the high demands of the marine and camping industries. The fabric used is both anti-mold and treated for UV and water resistance, created with a mix of cotton and polyester in order to retain the soft feel of natural canvas while achieving the longevity of a technical fabric. 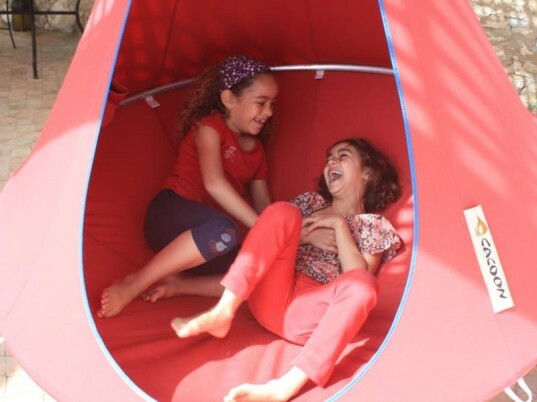 Cacoon comes in two handy sizes, a smaller size perfect for one adult or a couple of kiddos and a larger size that fits two stretched out (and relaxed) parents. Cacoons are currently available ‘off-the-shelf’ in either off-white or leaf green but if you want to stand out, Cacoon can create this tent in just about any color you can dream up. Cacoon will even add logos and branding if you’re interested in acquiring some peaceful hanging tents for your business – think B&B, hotel or resort. 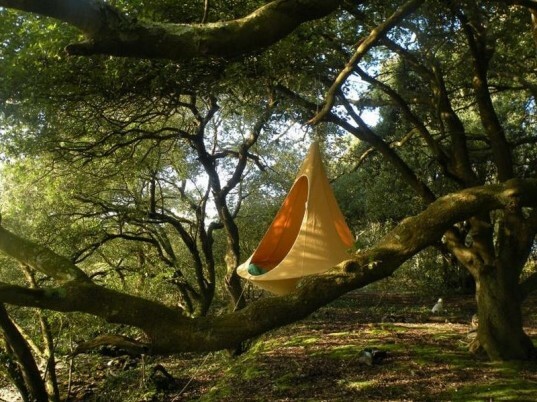 First and foremost, Cacoon will hang anywhere so long as the branch, beam or bracket you’re using is strong enough to take your weight and the weight of any friends who may be joining you. After that, hanging your Cacoon is easy and requires zero tools. You simply hang Cacoon where it won’t bump into walls or tree trunks, securely knotting the hanging rope. It’s important to note that Cacoon is not meant for jumping into or being used as a trampoline or swing. Cacoon is very simple to care for and keep clean. You can toss Cacoon right into the washing machine on cold (sans bleach) and then air dry it. You can also wash down your Cacoon while it’s hanging, using warm, soapy water followed by a clean water rinse. 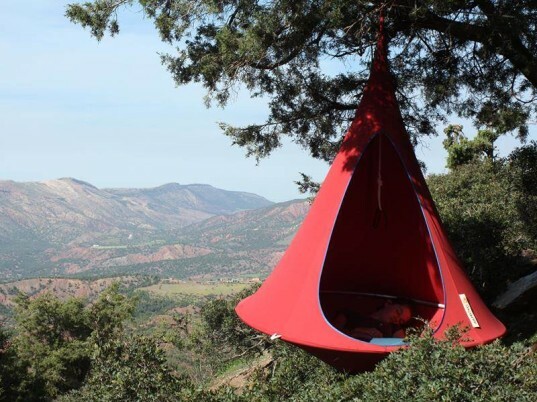 For a hanging tent, Cacoon is surprisingly affordable, starting at just $340 for a single and $500 for a double. All Cacoons come with a one year warranty and can be ordered directly from the Cacoon website. Cacoon is a hanging tent that's weather tested to withstand wind, rain, sunshine and sea, but it hangs equally nicely indoors as well. 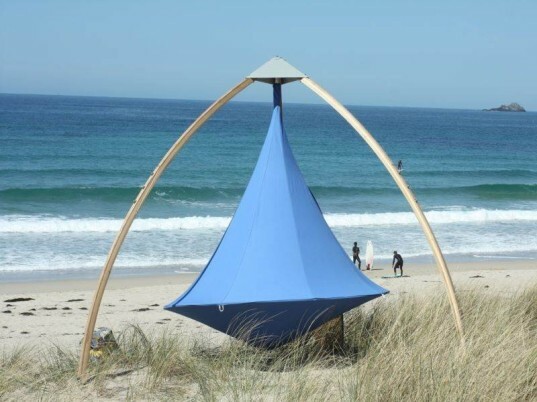 Made with both adults and children in mind, this tiny hanging nest-like tent is a must for private relaxation and fun, created by a team of folks well-versed in safe, architectural fabric and textile technology for onshore structures. Due to Cacoon's lightweight, non-rusting aluminium ring you can easily pack and carry Cacoon with you on vacation or move Cacoon to a new spot in the garden with ease. Cacoons are currently available 'off-the-shelf' in either off-white or leaf green but if you want to stand out, Cacoon can create this tent in just about any color you can dream up. Cacoon will even add logos and branding if you're interested in acquiring some peaceful hanging tents for your business - think B&B, hotel or resort. First and foremost, Cacoon will hang anywhere so long as the branch, beam or bracket you're using is strong enough to take your weight and the weight of any friends who may be joining you. After that, hanging your Cacoon is easy and requires zero tools. 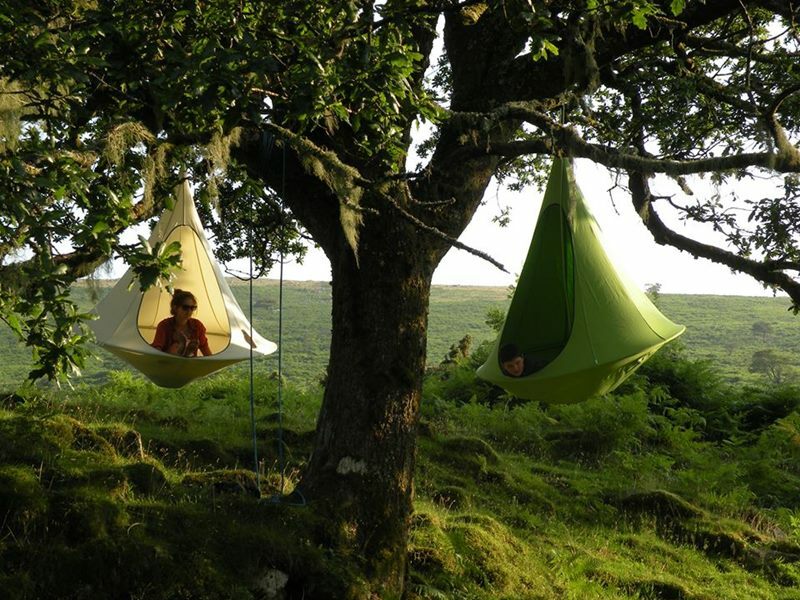 You simply hang Cacoon where it won't bump into walls or tree trunks, securely knotting the hanging rope. It's important to note that Cacoon is not meant for jumping into or being used as a trampoline or swing.